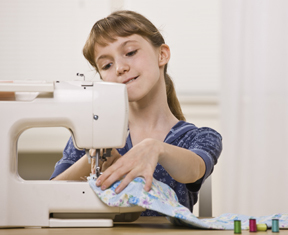 The Quiltzette: Classes for Kids; Clearance on Sewing Machines; New Fabric! Coming This Summer . . . Classes for Kids! 12-15 year old students - June 2, 9, 16, and 23 from 1:30 until 4:30 p.m. each day. These are Tuesdays. 8 - 11 year old students - June 4, 11, 18, and 25 from 1:30 until 4:30 p.m. each day. These are Thursdays. Watch the newsletter for more details soon including the list of projects for each group and class fees. We will provide sewing machines for the students to use. For more information talk to Aimee the next time you're in the shop. This collection arrived last week. 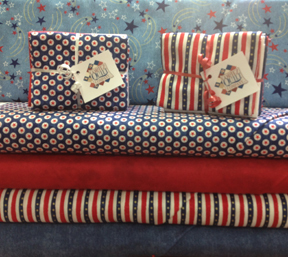 You have plenty of time to make a beautiful red, white, and blue tablecloth, placemats or quilt for Fourth of July! We also received a nice shipment of Hoffman charm packs and layer cakes last week. We like this company for pre-cuts because each packet comes with 40 different fabrics. Guest teacher Ila Starks has made so many of these great totes that we’ve taken to calling it the “Ila Bag” around here! This large, functional, and fun-to-make tote is perfect as an overnight or travel carry-on bag, diaper bag, or just as a nice, large purse. Sign up for this two-day class by calling 970-565-7541. There is only ONE space left! This month you’ll have the option to make these modern looking placemats and/or a matching table runner. The pattern includes instructions for both. Quilt-as-you-go and no curved piecing means you go home with a finished project. How great is that? Judy Bryan made the sample and will teach this class. NOTE: You do not have to be a monthly “member” to participate in Placemat Club. You are free to pick and choose . . . take one class, take one occasionally, or come every month if you are so inclined. See the full class schedule here. 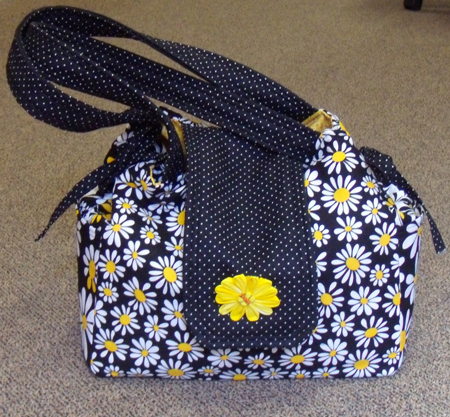 Every quilter has her (or his) favorite way of making and sewing on binding, but we can always learning something new! For our April Third Thursday Demo we’ll show how we teach this important technique to our beginning quilters here at Cortez Quilt Company and then view a series of short videos that reveal a wide variety of ways to make this task quicker and easier. Third Thursday Demo is always free. Join is at either 12:30 or 5:15 for 20-30 minutes of inspiration. How does wrapping up your busy week with a Friday evening sewing with friends sound? Call 970-565-7541 today to register for Quilt ‘Til You Wilt on Friday, April 24. Bring a project and dinner (or order out from one of the many nice restaurants on Main Street) and settle in for an evening of fun and creativity. Beverages are provided. This event is free but limited to 12 people so don’t delay in signing up! We've loved the BERNINA seven series machines from the moment we became a dealer a little over a year ago. The 710, 750QE, and 780E are truly amazing. Karen has the 710, Judy has the 750, Cindy has the 780, and Aimee is trying to make up her mind! One of BERNINA's core principles is continuous innovation. In keeping with that philosophy they are coming out with a new series of sevens . . . the 740, 770QE, and 790E. These models have new features that are sure to impress, but that doesn't mean that the "old" sevens are any less fabulous. And guess what? We have ONE 710 and THREE 780Es in stock that are marked down to clearance prices. If you've been thinking of buying a new machine now is the time to act! Come in THIS WEEK for a great deal on a great BERNINA. If you're interested in seeing the new seven series machines, come by the shop. Our 770QE demo model arrived today and the other two are slated to be here shortly. Use the Quilter Program within BERNINA Embroidery Software 7 when creating your next quilt. Design your own block design or use one of the many blocks that are built into the software. 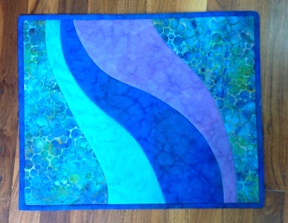 It is easy to do and you can even scan your fabrics into the software to see how your quilt will look before you begin. Bring your laptop loaded with Designer Plus 7. Please register by noon on Monday, April 13 by calling Cortez Quilt Company at 970-565-7541 or send an email to cindy@cortezquiltcompany.com with your RSVP. NOTE: Even if you don't own a BERNINA or have the Designer Plus 7 software but are curious to see how this program works, please join us and get inspired to design a quilt! 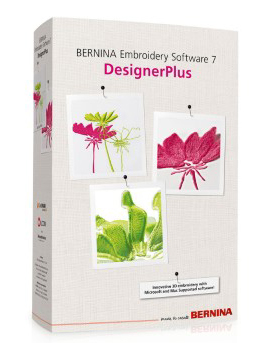 We have scheduled a series of Mastery Classes for BERNINA Software 7. We will meet the third Tuesday evening in April, May and June beginning at 5:15 p.m. You should plan to bring a laptop loaded with Software 7. It is highly recommended that you attend all three classes in sequence. If you aren't available for all three classes, contact Cindy to see if an exception can be made. In this class you will learn the basics of Software 7 including . . . In this class you will edit designs and learn a variety of ways to auto digitize designs. More details about the curriculum for this session coming soon. In this class you will learn how to manually digitize a design, applique, techniques for multi-hooping, and more. More details about the curriculum for this session coming soon. Foot of the Month - 25% Off! Echo quilting and CutWork foot # 44C is your ideal companion for a host of creative sewing projects. Suitable for both echo (shadow) quilting and free-motion quilting, this presser foot also makes it a cinch to create free-motion embroideries and gorgeous thread paintings with a zigzag stitch. Together with the BERNINA CutWork Tool and the associated BERNINA CutWork software, Echo-quilting and CutWork foot # 44C is also ideal for producing BERNINA CutWork designs. Discover the versatile BERNINA Echo-quilting and CutWork foot # 44C now. Regular price is $52. For the entire month of April this foot is only $39. Having the right tools at hand make sewing and quilting both efficient and fun. We carry a wide variety of marking instruments and choosing the right one for the task at hand can help ensure your best results. For example . . .
Frixion pens are a favorite here at the shop for marking fabric. They come in a wide variety of colors, glide easily onto the fabric without pulling, and - best of all - the marks disappear instantly when you touch them with a hot iron. Use these only when you plan to remove your marks in relatively short order. Don't mark your fabric and then set it aside for a week before ironing. Also, be careful not to accidentally iron off marks before you mean to . . . we've done that a time or two! 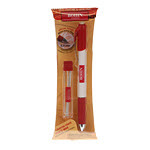 These pens are also great for checking off steps or cutting instructions in a pattern as you work. When you're finished with your project, just lightly iron the pattern so that your check marks or other notes disappear and it's as good as new and ready for the next time you want to use it. Our only real issue with Frixion pens is that they don't make one in a light color so that we can use them on black or other very dark fabric. We wish they would make one that marks in silver. Karen will plead our case to the powers that be when she goes to quilt market in May. 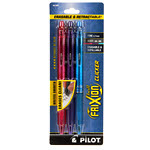 We stock Frixion pens individually and in the handy three-pack shown here. 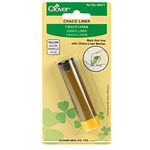 Chaco Liner markers by Clover are our other "go to" tool, especially for darker fabrics. 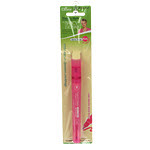 These come in four colors (white, pink, yellow, and blue) and they are refillable. Chaco Liners make a nice thin line on fabric using a tiny wheel that distributes the chalk. The Bohin mechanical marking tool is nice because it makes a very fine line on fabrics and you can purchase refill leads in several colors. The pen comes with white refills. The lead used in this pen is dense so you have to apply a bit of pressure to make a good chalk mark, but the upside is that because of the composition of the lead it lasts quite a while. Trace 'n Mark from Clover is unique in that there are two line thicknesses from which to choose, one on each end of the pen. This one comes in pink and marks disappear naturally over time or immediately with water. 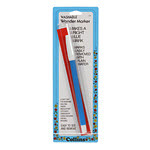 And finally there is the Washable Wonder marker from Collins. This pen marks in a bright blue which is easy to see on most fabrics (except maybe bright blue!). The marks are easily removed with water. The package warns not to iron over marks before removing them as this may "set" the image into some fabrics. When using this tool or the Trace 'n Mark be sure to keep the caps on tightly between uses or they'll dry out like any felt tip pen. So there you have it . . . fabric markers for every sort of project you can imagine!